Gallia Academy senior Adam Sickels relays a throw from left field back to the infield during Friday night’s OVC baseball contest against Portsmouth in Centenary, Ohio. CENTENARY, Ohio — At least the Blue Devils found some offense. 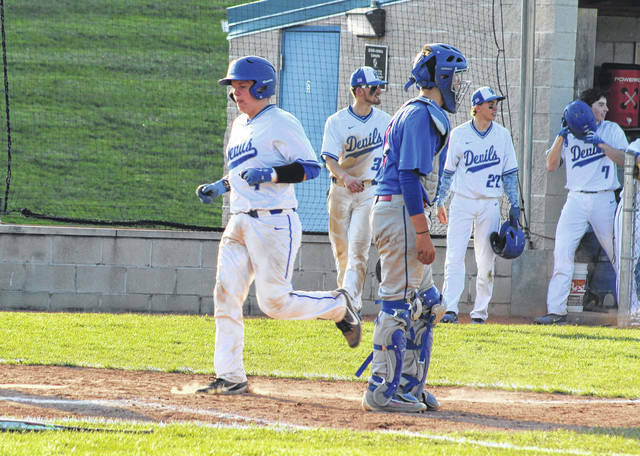 The Gallia Academy baseball team pounded out 17 hits and scored a season-high in runs while ending a two-game losing skid on Friday night during a 24-14 victory over visiting Portsmouth in an Ohio Valley Conference contest at Bob Eastman Field in Gallia County. The Blue Devils (4-4, 3-2 OVC) trailed 1-0 after a half inning of play, but the hosts reeled off eight consecutive runs while establishing a permanent lead of 8-1 after two complete. The Trojans countered with a pair of runs in the third, but GAHS answered by sending 15 batters to the plate in the home half of that frame. The end result was a 10-run outburst on six hits, three walks and four errors — giving the Blue and White a sizable 18-3 advantage after three full innings of work. PHS, however, rallied by sending 11 hitters to the plate in the top of the fourth, which yielded seven runs on five hits and three walks while trimming the deficit down to 18-10. 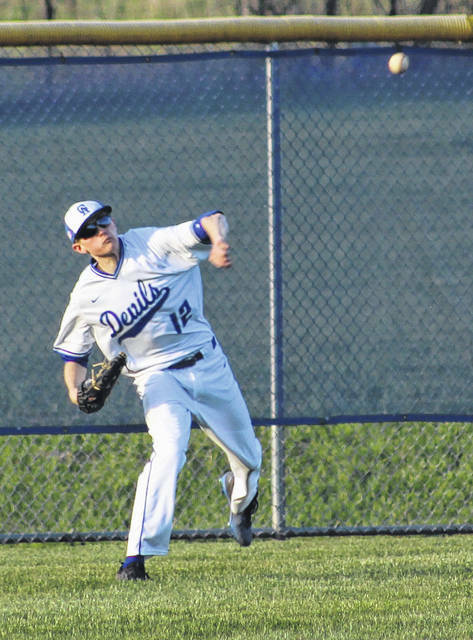 The Blue Devils added a run in the fourth to extend the lead out to nine, but Portsmouth put together one final rally as the guests scored four times in the top of the fifth — making it a 19-14 contest. Gallia Academy, however, responded by scoring five times in the home half of the sixth — which ultimately produced a mercy-rule decision. Josh Faro and Dylan Smith both scored on a two-out error that allowed Matt Moreaux to reach safely, and those two runs completed the 10-run outcome. GAHS outhit the guests by a 17-13 overall margin and committed only two of the 11 errors in the contest. The hosts left nine runners on base, while Portsmouth stranded six on the bags. Faro was the winning pitcher of record after allowing three runs (one earned), four hits and one walk over three innings while striking out four. Zach Kinney took the loss after surrendering nine runs (seven earned), eight hits and three walks over two frames while fanning two. Smith led the Blue Devils with four hits, followed by Moreaux and Braden Simms with three safeties apiece. Faro and John Stout were next with two hits each, while Morgan Stanley, Cole Davis and Kaden Thomas added a hit apiece to the winning cause. Moreaux drove in a team-best five RBIs and Smith knocked in four RBIs, with Stout also driving in three scores. Simms and Adam Sickels also had two RBIs apiece in the victory. Simms scored a team-high five runs, while Stout, Smith and Sickels each crossed home plate three times. Faro, Davis and Thomas also scored two runs apiece. Bryce Wallace led PHS with four hits and Zach Basye was next with three safeties. Kinney drove in a team-best five RBIs, while Wallace and Isaac Kelley each scored three runs apiece in the setback.